5 key things that matter to your window and door energy efficiency. Various frame materials offer different benefits, such as strength, durability, and the ability to custom finish but how does it impact energy efficiency? Aluminum windows are strong, but are not very energy efficient. Wood windows can be custom finished to match your decor, but they aren’t very insulating. PVC windows, like Sunrise windows, offer the best energy efficiency if they are filled with a polyurethane insulating foam. Without this foam, vinyl windows can be pretty inefficient. So make sure you ask about the type of insulation! Sunrise windows are made from premium, pure virgin uPVC that helps keep your home insulated and is specially designed to be extremely strong and durable. The frames are filled with polyurethane insulating foam to give you the best protection from energy loss. Add to that the ability to custom paint the exterior of your windows and the full catalog of designer options, and Sunrise windows bring you the best of all worlds. “Low-E” refers to a special coating that reflects infrared light, keeping heat inside your home in winter and shielding your home from the heat in summer. This coating also reflects damaging ultraviolet light, which helps protect interior furnishings from fading. Sunrise offers several low-e options to help you get the best protection no matter where you live. Two panes of glass, with an air- or gas-filled space in the middle, insulate much better than a single pane of glass. Some ENERGY STAR qualified windows include three panes for even greater energy efficiency. Sunrise offers both dual- and triple-pane options with a variety of low-e combinations that meet or exceed ENERGY STAR requirements. Some energy-efficient windows have argon, krypton, or other gases between the panes. These odorless, colorless, non-toxic gases insulate better than regular air by reducing the conduction of heat in the space between the panes of glass. 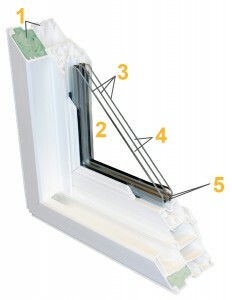 Sunrise windows are manufactured with a 90% argon or krypton gas fill, or come air-filled for high-altitude areas. To learn more about gas fill, visit the Efficient Windows Collaborative site, https://www.efficientwindows.org/gasfills.php. A spacer keeps a window’s glass panes the correct distance apart and insulates pane edges, reducing heat transfer through the window. Spacers can come in many materials, from aluminum to stainless steel to foam. Besides insulating the panes, spacers need to be durable enough to handle the flex of the glass as it heats and cools throughout the day–all without losing the airtight seal. Sunrise windows have a structurally sound, stainless-steel spacer with moisture-absorbing desiccant beads inside. This means that when tested under accelerated weather conditions, Sunrise glass systems outlast the competition. 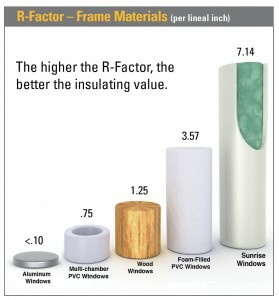 To learn more about spacers, visit the Efficient Windows Collaborative site, https://www.efficientwindows.org/spacers.php.